There is usually limited information available when writing about a demolished house. However, with Osmaston Manor it was different. This house threw up different challenges. When researching the house and its people the amount of material proved almost overwhelming. The outcome was one of the longest pieces I have written but as the story took shape the eventual outcome was inevitable. If Osmaston Manor had survived it would now be considered one of Derbyshire’s finest houses. Alas, for this country house, it suffered highs and lows, the result of ‘boom and bust’ circumstances, which in turn created a love-hate relationship for its owners. Osmaston Manor was built for Francis Wright (1806-1873) who inherited the estate from his mother’s family (she was a daughter of Francis Marcus Beresford of Compton House, Ashbourne and Osmaston). The Osmaston estate had originally belonged to the Meynell family of Bradley. The Wright family were Nottingham bankers but made their fortune from iron and coal production. Francis Wright was the head of the Butterley Iron and Coal Company from 1830 until 1873. When he became senior partner the company was valued at £30,000 and to underline its success its assets amounted to £436,000 by 1858¹ He was also connected to Codnor Park and several other large collieries in Derbyshire. According to the Sheffield Independent he might have been termed a Christian in the broadest sense of the term. He was a supporter of the Church Missionary Society, the Church Colonial Aid Society and the British and Foreign Bible Society for Promoting Christianity amongst the Jews. In his time he would build a new church, new schools and properties at Osmaston and become a benefactor of the Derbyshire Royal Infirmary². His biggest achievement was his involvement in the foundation of the Trent College, a public boarding school for boys in Long Eaton. Wright had married his cousin Selina (1806-1888), the daughter of Sir Henry FitzHerbert of Tissington Hall, in 1830. They made their home at Lenton Hall in Nottinghamshire but saw the land at Osmaston as their future. Looking to build a new home worthy of his position Wright appointed Henry Isaac Stevens (1806-1873) of Derby to oversee the work. The architect was a brave choice as Stevens’ previous work had mainly been church designs but it would become his greatest commission. The house was built by Messrs. Ford and Co of Derby and was completed in 1849 in Victorian Tudor style with more than a passing resemblance to Tissington Hall. Osmaston Manor had 70 rooms, a bake-house, wash-house as well as a brew-house. It had a subterranean railway, hot-air central heating and a central tunnel carried smoke from the house to a communal garden chimney, 150 feet high in Italianate style¹. The house was 330 feet long and a height of 192 feet. The terraces covered 4 acres of ground. It was set within 3,500 acres of parkland with lakes and trees. Sir Joseph Paxton is believed to have advised on the layout of the park. Francis Wright would live at Osmaston Manor until his death from bronchitis, aged 66, in 1873. He left 5 sons and 5 daughters – the oldest of which was John Wright of Eldensley House² who inherited his father’s estates. Another son, Francis Beresford Wright, lived at Aldercar Hall. While Osmaston Manor enjoyed the trappings of success under Francis Wright the same could not be said under the guardianship of John Wright. John Wright (1831-1901) had been married twice. He married Emily Sophia Plumptre in 1853 and, following her death, was wedded to Florence Mary Rice in 1861. In his lifetime he would become Deputy Lieutenant of Derbyshire and Justice of the Peace for Staffordshire and Derbyshire. The following year, in 1874, he was entangled in a legal battle concerning the purchase of Dearham Colliery in County Durham. Wright believed he had bought the colliery through an intermediary for £90,000 only to find that the purchase had actually cost just £60,000. The aggrieved Wright initiated criminal proceedings against a Mr Henry Osborne O’Hagan (who had bought the colliery), Mr Isaac Armstrong, Mr James Saunders, the Cumberland Union Banking Company, the London and Provincial Bank and the London and Liverpool Financial Association, all of whom he believed implicated in the fraud. In the end only O’Hagan and Saunders were tried at the Central Criminal Court where the jury returned a verdict of not guilty. It was a harsh lesson for John Wright and, with large estates to support, suggests the family wealth was not what it was. Something needed to be done and the first signs of change came when John Wright rejected his patronymic and changed his name to John Osmaston in 1876. He stated that there were several magistrates of the same name in Derbyshire⁴ but it is more likely he had a long term plan. In 1883 it was announced in a London newspaper that the estates of the late Francis Wright at Osmaston, Shirley and Ednaston, in Derbyshire, and at Langar and Barnston, in Nottinghamshire, were to be sold at auction⁵. Victorian property owners had begun to realise that there was a natural decline in property values if they were not carefully attended to. To ensure that wealth remained for future generations many ‘impoverished’ landowners resorted to the Settled Estates Act which effectively set them free of unwanted and unsustainable properties. Income raised from the sale could then be used for them to live in relative comfort for the rest of their lives. The Osmaston Manor Estate, comprising 3,400 acres, with a rent roll of £6,000 per annum, failed to sell at the August auction. The main problem was Osmaston Manor which was thought to be out of proportion to the value of the property and could not be kept up in adequate style on less than at least twice the rental of the Derbyshire and Nottingham estates put together⁶. Despite its failure to sell at auction there were interested parties willing to take on the financial burden of Osmaston Manor. In November 1883 it was reported that the estate had been bought by Sir Samuel Wilson (1832-1895) who had made his fortune by sheep farming in Australia. On returning to England he had leased Hughenden Manor from Lord Beaconsfield and his vast fortune was more than enough to cover the upkeep of Osmaston Manor. Wilson was understood to have paid £206,000 for the Osmaston Manor Estate, including the entire contents of the house, with the exception of the pictures. This was thought to be a low price for such fine estate with many experts stating it was worth at least £25,000 more than that⁷. At the time of the sale it was estimated that Francis Wright and John Osmaston had spent close on £250,000 to build and upgrade the house and grounds. However, Sir Samuel Wilson was to be frustrated and the potential sale didn’t receive the necessary consent or ratification. The likelihood was that the sale didn’t meet the necessary formalities specified in Lord Cairns’ Settled Estates Act, under the enabling powers of which alone the property could only be sold. No sooner had the sale fallen through when, just twelve hours later, Sir Andrew Barclay Walker stepped in to buy Osmaston Manor. The deal was completed in January 1884 with the Liverpool businessman paying £206,500 for the mansion, including the furniture and contents, excepting the pictures⁸. Before John Osmaston could sever his ties he had the final task of disposing of the entire collection of valuable paintings from Osmaston Manor. The collection, enriched with bronzes and statutory, had been brought together by Francis Wright and his son and was said to have cost £150,000. The auction took place at the Lecture Hall at Wardwick, Derby, in March 1884. Commentators of the day questioned why so extensive a collection had not been sent to the rooms of Christie, Manson and Co in London. The auction catalogue claimed that two well-known works were included in the sale. These were the ‘Monna Lizza’ by Leonardo da Vinci, and ‘The Magdalen’, by Murillo, purchased direct from the Queen of Spain. Also included were ‘The Annunciation’ by P.P. Rubens; ‘The Fight for the Standard’, the engraved work by R. Ansdell, R.A.; ‘A River Scene’ by Constable, R.A.; three grand works by J.M.W. Turner⁹. On the day of the auction John Osmaston answered his critics by stating he had offered the pictures in Derby because he thought many of his friends in the country would be glad of an opportunity of purchasing some of them. Mr Huggins, the auctioneer, said that one of the conditions of the sale was that he could not guarantee the authenticity of any of the lots and that considerable doubt was cast upon their genuineness¹º. In the end the bidders were unconvinced. Proceeds from the entire auction raised a paltry £7,000 – ‘The Magdalen’ sold for 1,900 guineas and the ‘Monna Lizza’ scraped a mere 50 guineas! So ended John Osmaston’s shorts and ill-fated tenure at Osmaston Manor. We can only speculate as to his character and business acumen but evidence suggests he spent far more than he could afford and the only solution was to dispose of the estates. John Osmaston, lighter in pocket, was now free to move to another country house, Hawkhurst Court, Billingshurst, in West Sussex. In time he would become a J.P. for Sussex and would remain there until his death, aged 70, in 1901. At the time of his death his estate was sworn at £2,826¹¹. By sharp contrast his father, Francis Wright, had left personal estate worth £700,000. 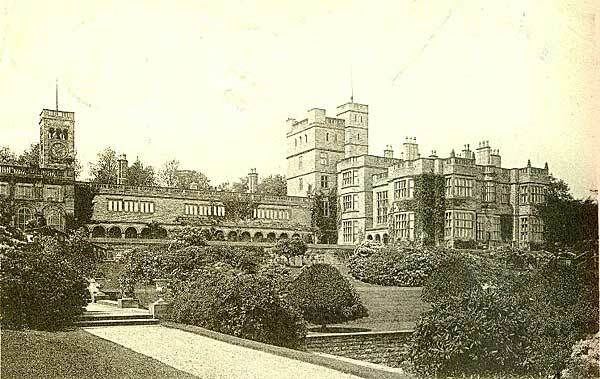 His mother, Selina Wright, would live in the Dower House at Yeldersley Hall and died in 1889. Andrew Barclay Walker was the second son of Peter Walker of Auchingflower who had been the head of the Fort Brewery in Ayr. His father had removed to Liverpool and after completing his education at Ayr Academy and the Liverpool Institute Andrew Walker was taken into partnership in his father’s brewing business. In the course of his early career it is told that, at one time, becoming aware that foreign brandy would probably become scarce wowing to the failure of crops, he at once applied himself to buying up all the brandy that he could get control of. His anticipations proved accurate and he made a sum of money¹³. In 1853 he had married Eliza, the daughter of John Reid, of Limekilns, Fifeshire. Walker had served as a magistrate for Ayrshire and sometime afterwards was made a magistrate for the county of Lancashire. His chief residence was at Gateacre Grange, Liverpool, and joining the municipality had risen to the position of alderman. He had first been elected Lord Mayor in 1873, and the day after his appointment he had announced his intention of presenting the city with an art gallery at a cost of £20,000. For many years he had been in the habit of gathering numbers of poor men and women about him to enjoy a Christmas treat, which he provided for them in Toxteth. A highlight of his career was a visit by the Duke of Edinburgh to lay the foundation stone at the Walker Art Gallery. As it was approaching its completion in 1876 the council thought it right that Walker be re-elected as Lord Mayor. To celebrate he presented the council with a handsome jewelled badge to be worn by future mayors on state occasions. Walker had spent a number of years cruising with Lady Walker who had been suffering a lingering illness. She died in 1882, leaving behind her six sons and two daughters, the eldest being Peter Carlaw Walker (1854-1915). By the time Andrew Walker purchased Osmaston Manor he was the head of Peter Walker and Sons and a very wealthy man†. It was understood he owned half the public houses in Liverpool. His main brewery was at Warrington with a second one added at Burton-on-Trent. Walker was also the proprietor of coal mines in South Wales. In the same year the Liverpool Corporation built an extension to the art gallery, and Walker generously covered the cost of £12,000. In 1885 he was awarded a baronetcy and would become known as Baronet Walker of Gateacre in the County of Lancaster. He was also appointed Deputy Leiutenant of the same county. ‘The entrance hall is a spacious and pleasant chamber, as are the principal rooms, but the smoke room is evidently much appreciated. Though its appointments are good, and its panelled ceiling of timber very fine, it has an essentially cosy appearance. Like the rest of the house, it is lit with the electric light. I found Mr Richard Keene, the well-known photographer of Derby, taking a variety of views of the mansion and its surroundings. For many years Sir Andrew Walker had known Sir Henry Wilmot, by whose advice, rumour has it, he bought Osmaston Manor. Be that it may, ever since that never to be forgotten garden party, to which the whole county was invited for Sir Andrew by Lady Wilmot, the popularity of its owner has gone on increasing with all classes. Only at the last county ball at Derby the guests were equally astonished and delighted at the sumptuousness of the supper and the excellence of the wines, and it only accidentally oozed out that the supper was the generous gift of Sir Andrew. He is a munificent subscriber, I heard, to all charitable and religious agencies for good, but withal he gives with discretion. He is a familiar presence at county gatherings, and with the middles classes and poor he has made his name a household world no less than with the county gentry’. In October 1887 he married for a second time. His bride was Maude, the second daughter of Mr Haughton Charles Okeover, a family of very old standing and who had held the lordship of Okeover for over 700 years. Maude had served Queen Victoria in the capacity of Maid of Honour and was rewarded with several wedding presents including a beautiful diamond, ruby and pearl brooch, with a piece of hair and a photograph of her majesty in a silver frame. Sir Andrew Walker was a private man but an extremely generous one. He had contributed £1,000 towards the rebuilding of Derbyshire Royal Infirmary, of which he served as president in 1886. He also sat on the committees of the Derbyshire Agricultural Society and Derby Charity Organisation Society as well as becoming vice-president of Derbyshire County Cricket Club. He was also vice-president of the Derbyshire Natural History and Archaeology Society, a patron of the Derby Burns’ Club, and a director of Francis Wright’s Trent College. While Sir Andrew was a popular and kindly landlord his stay at Osmaston Manor was relatively short. He had suffered ill-health and even his wedding to Maude Okeover had to be delayed several months while he recuperated on his yacht and a visit to Scotland¹². During early 1892 he was confined to his room at Gateacre Grange for several weeks with a severe illness. It was a sickness he would never recover from and he died in February leaving estate worth £2,876,781¹⁴. Walker left the Osmaston estate, together with its contents,as well as the Belle Vue estates and adjoining property at Little Woolton, near Liverpool, to his eldest son, Peter Carlaw Walker¹⁴. Gateacre Grange was left to another son, William Hall Walker, and another property, The Knoll, at Barton-under-Needlewood, to John Reid Walker¹⁴. In 1895 Lady Maude Walker would marry Lort Phillips, of Lawrenny Park, Pembrokeshire, Master of the Pembroke Hounds. Sir Peter Carlaw Walker, 2nd Baronet, was just 38-years-old when he inherited Osmaston Manor. With the huge burden of maintaining his father’s popularity he wasted no time taking on Sir Andrew’s affairs. As the head of the Walker and Sons he looked to expand its portfolio of public houses. In 1894 he formed a property company for the purpose of opening new sites and to carry on the business of brewers, maltsters, ale, beer, porter and corn merchants¹⁵. Unlike his father he had been educated at home, proceeding to neither public school nor university. Instead he had developed a prowess at sport. Big game fell to his rifle in Norway, Ceylon, Assam, Colorado, Wyoming and British Columbia. He was also a keen sailor, being a member of the Royal Yacht Squadron at Cowes and spending six months in the south seas sailing around in a 30-ton coasting schooner. Walker was a strong supporter of the National Hunt and later appointed the trainer, Johnny Latham, to oversee his jumpers. His business interests would be divided between Derbyshire and Lancashire. He was a Deputy Leiutenant and Justice of the Peace for Derbyshire, and a Deputy Lieutenant for Lancashire, of which county he was also High Sheriff in 1896-7. Although a staunch unionist he had little time for politics, nor indeed public life in general. He would be remembered as a generous landowner and country gentleman, an ardent follower of the hounds, a consistent patron of the turf, and perhaps above all as a keen officer in the auxiliary forces seeing out 35 years of service in the Lancashire Yeomanry and Derbyshire Yeomanry. He would reach the rank of Colonel in 1906 before handing over to Lord Henry Bentick, in 1912. He was President of Derbyshire Royal Infirmary in 1903 and presented the institution with a complete Finsen light apparatus for the treatment of Lupus. He also invited the inmates of the Liverpool Seamen’s Orphanage to Osmaston Manor every year. One of Peter Walker’s most interesting innovations at Osmaston Manor was a selection of Wyoming elk, which he purchased during one of his expeditions to the ‘Wild West’. In 1895 Peter Walker gave away his stepmother at her wedding to Lort Phillips which took place at St. Peter’s Church in Eaton Square. There was no doubt that the bond between Walker and his stepmother was close. Where similar relationships had failed it was through Maude Okeover that Peter Walker met his future wife. This turned out to be Ethel Blanche Okeover, his stepmother’s younger sister (d.1935), and the new Lady Walker of Osmaston Manor. Ethel Blanche Okeover, the step-daughter-in-law to her own sister, proved to be an able marriage partner. She became actively involved with the Derbyshire Children’s Hospital and was vice-president of the Derbyshire Red Cross Society. She also owned a number of National Hunt horses and raced under the name of Mr Shirley Park, taking the title from a neighbouring Walker estate. In 1900 the couple celebrated the birth of a daughter, Enid Walker (1900-1988), who would marry Count Cosmo Diodono de Bosdari in 1928 but it would end in divorce in 1949. She later remarried to Bernard H. Lofts-Constable in 1958. Despite his liking for privacy Peter Walker opened the gardens at Osmaston Manor to the general public for the first time in the summer of 1900. It was the start of an annual event that lasted many years with entry charges donated to worthy causes. The occasion was always a highlight of the calendar with specially arranged daytrips from Nottingham and Derby. In November 1902 Sir Peter and Lady Walker celebrated the birth of their son and heir. Ian Peter Andrew Monro Walker (1902-1982) was christened at Osmaston Church with the Countess of Kingston acting as godmother¹⁷. While Ian Walker enjoyed a charmed childhood his life would change dramatically in 1915. His father had been suffering from internal ailments for some time before entering a London nursing home in September 1915. The baronet underwent an operation and recovered sufficiently to be moved to Osmaston Manor. However, once settled in his own bed he suffered a relapse and died aged 61. On his death he left unsettled estate of £255,096 with net personlty £174,612. At the age of 13 Ian Monro Walker inherited the Osmaston Manor estate along with the death duties associated with it. Ian Walker fell into his father’s mould with a love for the outdoors. Under the watchful eye of his mother he shouldered the responsibilities as the 3rd Baronet at Osmaston Manor. His biggest contribution to Osmaston Manor was the creation of a polo ground within the grounds along with a riding school built for the purpose of housing polo ponies. The annual polo weeks would prove to be one of Derbyshire’s principal summer attractions. He became a prominent breeder of polo ponies and Ayrshire cattle. This measure of turning the estate into a company was designed to ease the burden of heavy taxation and one that the Duke of Devonshire and Duke of Bedford had already adopted. The following year Ian Walker bought Beresford Dale for £15,500, not for the Shirley Park Estate Company, but out of his personal wealth. The Dale, one of Derbyshire’s beauty spots, was well known for its excellent fishing and came with 576 acres. In 1935, the person who had protected his childhood from the pressure of baronetcy died. Lady Ethel Blanche Walker died at Osmaston Manor after a short illness. For one of these houses the future was not certain at all. Sir Ian Walker married Dorothy Elizabeth Heber-Percy (1913-2005) of Guy’s Cliffe, Warwick, in June 1938. She was the granddaughter of Lord Algernon Malcolm Arthur Percy, the second son of the 6th Duke of Nortumberland, and a former chairman of Warwickshire County Council. The best man was Ralph Curzon²¹. Despite the pressures of running a large country estate Sir Ian Walker remained a popular landlord. He had built new cottages and a village hall in Osmaston with traditional thatched roof and half-timbered style. The outbreak of World War Two saw Osmaston Manor handed over to the Red Cross to attend wounded soldiers. It also coincided with the birth of the couple’s first child, Elizabeth Anne Walker, born in 1940. She would be joined by Jane Katherine Walker (1942-2012) and Captain Sir Peter Ralph Leopold Walker (1947-2003). King Leopold of Belguim was one of Peter’s godparents explaining the use of his name for the future 4th Baronet. In 1942 Sir Ian Walker purchased the estates of Slains, including the picturesque village of Collieston and the historic Old Slains Castle. The estate, bordering on the rugged Aberdeenshire coast, extended to 8,000 acres, and included 54 farms and crofts²². As second-in command of the Derbyshire Yeomanry he saw active service throughout the North African campaign and eventually took over as commanding officer in 1944. The following year he was awarded the D.S.O. ‘for distinguished service’ in Italy. A string of would-be purchasers looked around Osmaston Manor but the house was not officially on the market. The most viable plan was to convert the manor into a girls’ school while retaining the estate. However, his departure depended on essential repairs being completed at Okeover Hall. In 1947 the Shirley Park Estate Company auctioned Yeldersley Hall further reducing their assets. However, with the future of Osmaston Manor seemingly doomed, he continued to develop his property portfolio elsewhere. In 1948 he had set up a new company, along with Lady Dorothy, called The Walker Scottish Estates Co, based at the House of Glenmuick in Ballatar, with the purpose of running estates in Aberdeen and Angus²³. Sir Ian Walker-Okeover died in 1982, aged 79, and Lady Dorothy died in 2005 reaching the grand old age of 91. The Osmaston Estate is still owned by the Walker-Okeover family as well as the House of Glenmuick, Ballatar, in Aberdeenshire. It is managed by Sir Andrew Peter Monro Walker-Okeover, 5th Bt (b.1978), and Lady Philippa Walker-Okeover. The foundations of Osmaston Manor still exist and the grassed terraces, ponds, stone steps and balustrades have been restored. Today it is called Osmaston Park and serves as a wedding venue where elaborate marquees stand on the site of Henry Stevens’ now forgotten masterpiece. “It happens this way in archives sometimes. One minute, you are moving a roll of plans from one shelf to another, and carefully keeping a record of its new location; the next, you are rediscovering some long-lost treasure. The plans are in a poor condition and conservation work will be needed. The original brewery was started by Peter Walker, father of Andrew Walker, at the Fort Brewery in Ayr. Through investors the business expanded to Warrington and Burton on Trent. Andrew Walker took over the business in 1890 and is credited with pioneering many production, distribution and management systems that are still in place within the industry. The group had a chain of pubs around Liverpool and the north west. The company merged with Cairns Brewery in 1921 and the Tetley’s Brewery of Leeds in 1960, to form Tetley Walker. In 1961 Tetley Walker merged with Ind Coope of Burton and Ansells of Birmingham to become Allied Breweries. This later became Allied Lyons in 1978 following a merger with J Lyons and Co. The business merged with Carlsberg in 1992 to become Carlsberg-Tetley and is now known as Carlsberg UK. What a fabulous article on Osmaston Manor. I have only just read it and it has put a lot of old family history in place. Must have taken months of research. Even though I live in Australia now my wife and I visited Osmaston Park a few years ago and Andrew Walker-Okeover showed us around. I remember feeling very sad as a young boy when I heard my parents talking of the demolition. Thank you, John. The research into Osmaston Manor was fascinating as was the history of your family. Your great great grandfather certainly left a legacy. I do feel sad about Osmaston Manor. I believe that, if it had survived, it would now have been one of Derbyshire’s most popular country houses. However, demolition probably seemed the right thing to do at the time. At least we have Osmaston Park as a fitting memorial. Fascinating article thank you, I first came across Osmaston Manor in my family tree research as my relative John Bardney was listed as Head Gardener to Sir A B Walker, what a terrible shame to lose the manor but i will now look forward to a visit to Osmaston Park especially knowing more of the history of the site. Many thanks for the excellent article. Thank you for your very welcome comments. I spent quite a lot of time researching Osmaston Manor and found it fascinating. I stand by my comment that had it survived it would have been one of Derbyshire’s finest houses. I’m sure that John Bardney would have had some wonderful stories to tell. Please go to Osmaston Park and use your imagination as to how it would have been. Let me know your thoughts. Regrettably a sign of the times I’m afraid. A thoroughly informative and clearly well researched article, no doubt outlining the fate that befell many country estates. Shame that what little remains of the manor house cannot be viewed, it would form the basis of an interesting visit for the imaginative. Hope to do the local estate walk so can at least see, albeit at a distance, the tower that served the flues of the many fireplaces in the manor house.